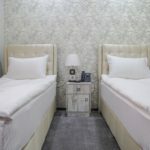 Standard rooms are located on the second, third and fourth mansard floors of the hotel Aivani Tbilisi and are equipped with double or twin beds. Rooms have access with elevator. Back view standard rooms have amazing views on Fortress Narikhala. 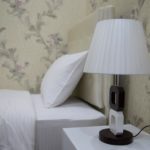 Standard rooms can accommodate one or two guests. Rooms are equipped with TV with international channels, free Wi-Fi, working table and chairs, cupboard, mini-bar, safe and private bathroom. Hotel Aivani provides bathroom amenities for all guests. Mansard floor has a huge corridor with cozy design, full of space and soft furniture, which is perfect for modern lifestyle travelers. Mansard rooms can accommodate two guests. Rooms are equipped with TV with international channels, free Wi-Fi, working table and chairs, cupboard, mini-bar, safe and private bathroom. Hotel Aivani provides bathroom amenities for all guests.